As James Morgan flies out to Indonesia for the umpteenth time, he bypasses the usual tourist hotspots and makes a beeline for the Coral Triangle, an area of immense beauty and home to the Bajau sea nomads. Morgan's vivid images that depict the daily life of this little-known sea-based community reveal an intriguing and captivating existence. The Bajau are a nomadic indigenous group living along the shores of Sulawesi and Kalimantan in Indonesia. They live off the sea and their livelihood revolves mainly around subsistence fishing and trading. Morgan first heard about the Bajau during his studies at the London College of Communication when searching for a topic for his masters thesis. He came across the Mokan, a tribe also known as the sea gypsies of the Andaman. "When the tsunami hit the area in 2004, the Mokan, who have lived in that area for generations, all survived. I was interested in the idea that because they knew the ocean so well, they managed to predict that a tsunami was coming and survived. However, they were already very well documented, so I did some more research and found the Bajau," Morgan said. Morgan received initial funding for this project from the Royal Photographic Society's postgraduate bursary. It took him six months of preparation before he made his way out. In the months leading up to his departure, he took a crash course in Indonesian and learnt how to free dive, which would allow him to get close and personal with his subject without the hassle of extra diving equipment. On his first journey he was accompanied by a reporter who had spent time in Indonesia earlier and had learnt the language. It wasn't too hard finding the Bajau, says Morgan. The majority of the community has been forced into settlements built on stilts near their fishing grounds. The local government has been trying to settle nomads to make everyone accountable as part of a campaign to cut piracy. Upon arrival, Morgan was taken out on boats to where the Bajau Laut spent most of their days and nights, fishing, playing, eating and sleeping. The images that came back depict a beautiful world that is fading and fast. One of his most striking images is of a young boy grasping on to the fins of his pet shark as he is propelled through water. The domesticated shark has its home in the waters under the stilt houses. 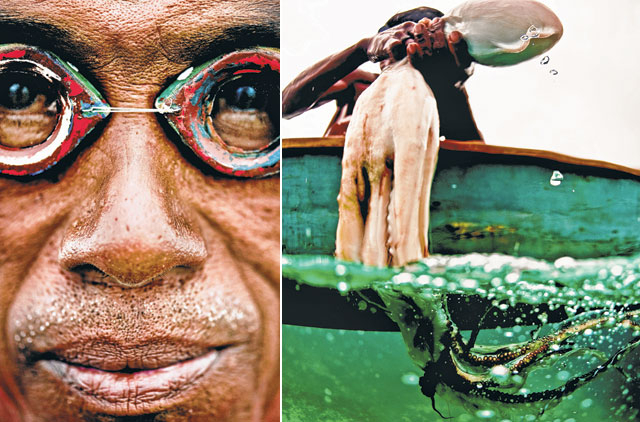 The intimate and age-old connection the Bajau have with the ocean is brought up again and again in the detailed shots of their fishing techniques, home-made goggles and rustic boats. 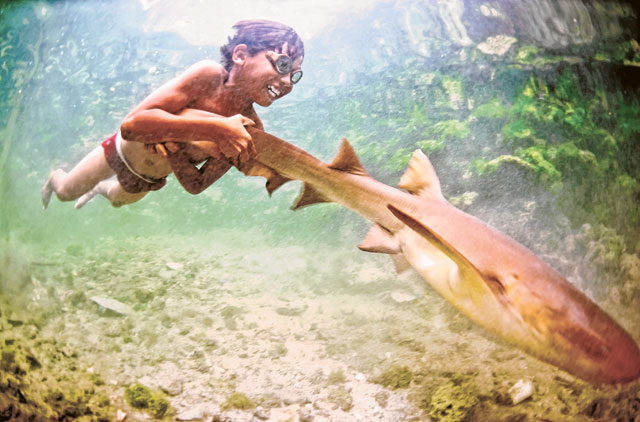 Because of the openness of the Bajau, Morgan found he could capture this community with ease. "People are usually really up for being photographed. We have had some issues with the Chinese fishing companies, who didn't really want us to photograph their operations because they were catching fish illegally, but apart from that it was OK," Morgan said. The photos also reveal some stunning scenery. "The area they live in is called the Coral Triangle. The waters are teeming with biodiversity and because of that there are many different cultures living off those waters," Morgan said. The area they live in is almost 1.6 billion acres of ocean bordered by Indonesia, Malaysia, Papua New Guinea, the Philippines, Solomon Islands and Timor-Leste. The area is home to 3,000 types of fish and 75 per cent of all known coral species. While more than 2,000 languages are spoken between the communities living in the area, they are unified by their vital connection to the sea and its offerings. "There's another community in Raja Ampat which has an interesting system where communities own marine land as one would own a farmland. They can do whatever they want with the land, so they take care of it and cultivate it," Morgan said. But the pictures also bring to light a sad reality. The wildlife of the area and the livelihood of these communities are at risk as bigger fishing companies and exporters look to make more profits at the expense of the area's delicate ecosystem. The fish that live in these waters are in high demand in restaurants across Asia. About $1 billion (Dh3.67 billion) worth of live reef fish are exported yearly from the Coral Triangle to Hong Kong. To make higher profits and increase export loads, fishermen use destructive methods such as cyanide and bombs to reel in larger nets of fish. "Some use cyanide and home-made bombs to get larger catches. We want to raise awareness about the dangers of this type of fishing. On the ground most people are happy to look for alternative ways of fishing. They realise their children won't be able to survive if they do this," said Morgan, who has expanded his documentation of the Bajau to include the illegal fishing that takes place in the same waters. As part of this wider project, he has teamed up with WWF and launched a campaign to raise awareness of these activities and bring some change to the shores. While Morgan works as project manager, taking photographs and developing the new website with WWF, the rest of the campaign is buoyed by blogs written by local residents encouraging responsible tourism to the areas. "Once the Coral website is up and running, I'm hoping it'll keep running and keep doing the things it is supposed to do," Morgan said. At 24, James Morgan is the proud laureate of a number of prestigious photography awards and nominations, including Travel Photographer of the Year ‘Encounters Portfolio' and winner of the Royal Photographic Society Bursary 2009. 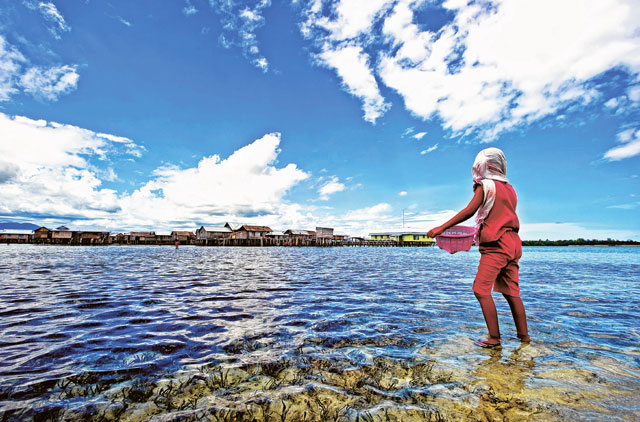 His images of the Bajau have graced newspapers, magazines and websites across the world, drawing attention to the environmental issues communities in the region face as a result of illegal fishing. Morgan's dislike of dense essays during his undergraduate studies at Sussex University encouraged him to use his camera to produce an alternative way of recording different communities. "On an exchange programme in Iceland, I started taking a lot of travel shots. From there I kept taking pictures," Morgan said. From there, he started travelling the world, homing in on certain subjects, lifestyles and issues, bringing them out in dramatic photo series. His first major photo essay depicted the livelihood of the eagle hunters in Mongolia. Contrasting the stark scenery with their intricate clothing and majestic form of the eagles, Morgan brings to life a regal tradition tucked away in a remote part of the world. His travels have taken him to a range of countries, from Siberia to Bhutan to the Galapagos and, most recently, to Indonesia, with many others in between.